Prime Minister Manmohan Singh on Tuesday offered a chadar at the dargah of Sufi saint Moinuddin Chishti on the occasion of the 801st Urs. Minister of State in the Prime Minister’s Office V Narayanasamy offered the chadar on behalf of Dr Singh. 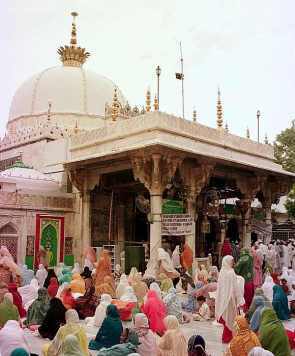 “Today, as people begin to gather at Ajmer Sharif to pray for and seek spiritual deliverance, it is equally important to remember that Khawaja Moinuddin Chisti's teachings have a practical relevance in the world we live in. It is only by respecting our fellow human beings in every way and by caring and providing for those who are in need that we can build a just, more humane and peaceful world. If we can do so, we would have truly lived up to the ideals of Khawaja Sahib," the message said. Khadim Syed Gani Gurdeji offered prayers for the country's progress and for the PM. Union Ministers Narayanasamy, Sachin Pilot, Namo Narain Meena and member of Parliament Ashk Ali Tak came to Ajmer by helicopter to reach the dargah. They went to Gumbad Shareef through Jannati Darwaja to offer the chadar. Health Minister A A Khan, State Minister for Education Naseem Akhter, MP Prabha Thakur and several Congress leaders and officials were also present. Anjuman committee and dargah committee have welcomed the PM's offering.